Any guitarist will tell you that a broken string can bring a jam session to a grinding halt. In addition, a set of old strings are difficult to keep in tune, susceptible to breakage and need to be replaced. Luckily, a guitar string winder makes the process of replacing or changing your guitar strings faster and more efficient than winding them by hand. Place the receptacle end of the guitar string winder on one tuning peg. Rotate it several times in the direction that loosens the corresponding string. Repeat with the remaining pegs until all of the strings are loosened slightly. Cut the first string with a wire cutter, and remove both ends of the string from the guitar. If changing the strings on an acoustic guitar, use the cut out groove on the string winder to pry the peg from the bridge. Select the appropriate new string, attach the base end to the bridge of the guitar, and thread the top end through the tuning peg. Leave a little bit of slack so there is excess string to wind around the tuning peg. Place the end of the guitar string winder on the tuning peg and tighten the string by rotating the string winder in the appropriate direction. Tighten the string until taut, and clip the excess ends of the string with a wire cutter. Repeat the steps with the remaining five strings. Tune the guitar with an electronic tuner. New strings require some stretching before they will stay in tune. Replace one string at a time. 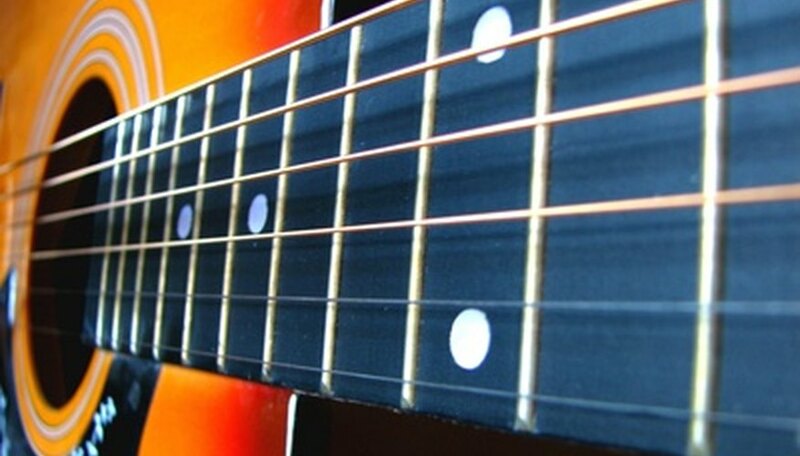 Removing all of the guitar strings at once can damage the neck of your guitar. Use caution when tightening guitar strings to prevent breakage. Based in Norfolk, Va., Ashley Berkman has been a freelance writer for LexisNexis since February 2010. Specializing in Web content, Berkman has contributed to numerous websites for private law offices. She holds a Bachelor of Arts degree in theater and communications from Old Dominion University and is currently pursuing a second degree in multimedia design.